After eating a bowl of tteokguk (rice-cake soup) and giving older family members a big bow on Seollal, chances are you will consider seeing a movie, a TV show or both, during the five-day holiday. From local family-friendly flicks to beloved animations and star-studded variety shows, here’s the handy guide to this year’s Seollal holiday entertainment on the small and silver screens. For those searching for local films to watch with their family, the comedy flick “Detective K: Secret of the Lost Island” is a sound choice for a bag of laughter. The film, a sequel to the 2011 box-office hit “Detective K: Secret of the Virtuous Widow,” both directed by Kim Seok-yoon, is dubbed the Joseon version of Sherlock Holmes. The uncanny detective Kim Min (Kim Myung-min) partners with his witty assistant Seo Pil (Oh Dal-su) to investigate a case that involves counterfeit silver ingots and the possibility of child labor exploitation. Another family-friendly title is the music drama “C’est Si Bon,” which taps into nostalgia for the 1960s and ’70s, when folk music was trendy among college students. The film is set in C’est Si Bon, a music cafe where legendary folk duo Twin Folio ― consisting of Yoon Hyung-joo (Kang Ha-neul) and Song Chang-sik (Jo Bok-rae) ― performed live. The film is about the fictional Oh Geun-tae (Jung Woo), who joins the duo as the third member, and their muse Min Ja-young (Han Hyo-joo). Following Walt Disney’s recent success with its animated film “Big Hero 6,” a variety of animated features for children will hit theaters. 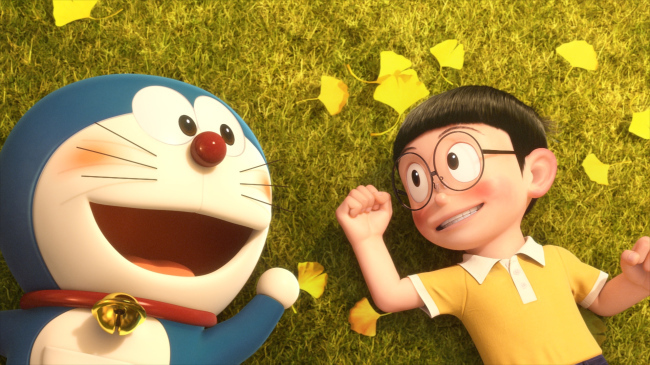 Based on the famous Japanese manga series Doraemon, the animation “Stand by Me Doraemon” will be released as the first-ever 3-D version of the series, to celebrate the 80th anniversary of Doraemon creator Fujiko Fujio’s birth. The film loosely connects seven episodes from the series to tell a new story involving Jingu and Doraemon ― one of Japan’s most well-known and beloved cartoon characters. Meanwhile, the American animated 3-D movie “The SpongeBob Movie: Sponge Out of Water” will hit theaters on the first day of the holiday, Feb. 18. In this SpongeBob sequel, the title character embarks on a quest to obtain a stolen burger recipe. The film is already soaking up the box-office dollars in the U.S. Among Hollywood titles, “The Imitation Game,” which bagged eight Oscar nominations, arrives in theaters amid much anticipation. 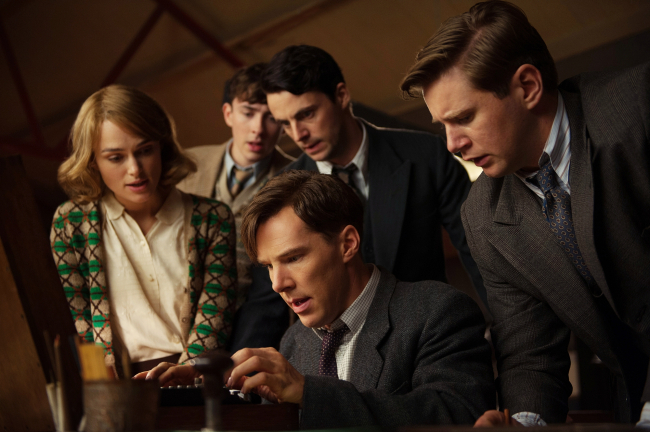 The film is a biopic of Alan Turing, a British code-breaker during World War II, played by Benedict Cumberbatch. Actress Keira Knightley stars as Joan Clarke, Turing’s fiancee and fellow code-breaker. The action-thriller “Kingsman: The Secret Service” is about a very exclusive, elite group of spies called Kingsman. The veteran secret agent Harry Hart (Colin Firth) selects a young, troubled protege, Eggsy (Taron Egerton), to join his group and trains him to become a spy. Samuel L. Jackson stars as the villain Mr. Valentine, who has a grand scheme to overthrow the world through using SIM cards. Local broadcaster KBS will present the special Seollal variety show “Game of Thrones,” with a stellar lineup of stars, including rapper Eun Ji-won, comedian Lee Hwi-jae, Jonghyun of SHINee, and Soyou and Bora of Sistar. They will participate in a series of games to determine the winning team. The show will air on KBS 2TV at 6:20 p.m. on Feb. 20. The annual holiday program “Idol Star Athletics Championships” will invite 200 K-pop singers and celebrities to participate in a variety of competitions, including archery, curling, and track and field. The special will be broadcast on MBC at 6 p.m. on Feb. 19 and 20. Nine single celebrities will star in a special program titled “Some Men, Some Women,” produced by local broadcaster SBS, all with the mission of searching for real love. They include actress and singer Chae Jung-an, Narsha of Brown Eyed Girls, actor Kim Ji-hoon and actor Shim Hyung-tak, who divide into three groups of three, and then live together and get to know each other. The two-episode reality show will air during the Seollal holiday, but the exact time has yet to be confirmed. Cable channel tvN will screen all 11 episodes of last year’s popular cooking reality show “Three Meals a Day” at 2 a.m. on Feb. 19. 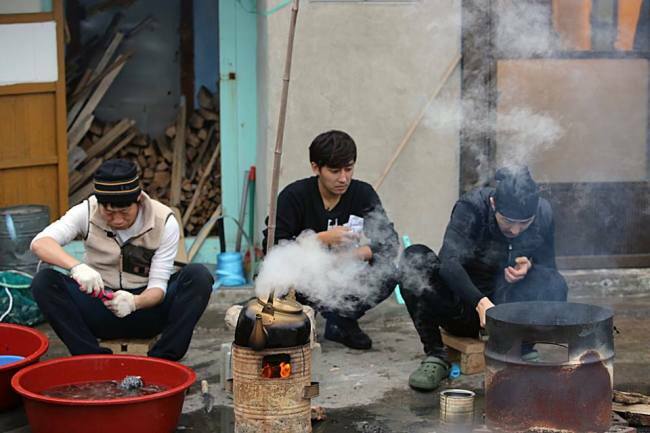 A new episode from the second season, titled “Three Meals a Day ― Fishing Village,” will air on Friday at 9:45 p.m. The episode will take viewers to the distant island of Manjaedo with actor Cha Seung-won and Yoo Hae-jin on a survival cooking journey.